Steve Wozniak, Apple co-founder and geek demigod, sees the future as rosy for humans, despite our failures in preventing the robot uprising. "We're already creating the superior beings, I think we lost the battle to the machines long ago," Wozniak said in a recent interview with the Australian Associated Press. "We're going to become the pets, the dogs of the house." Despite the visions of steely exoskeletons trampling human skulls his words elicit in fans of James Cameron's films, Wozniak sees the robot-controlled future as particularly bright for those of us with soft, fleshy skin. "Every time we create new technology we're creating stuff to do the work we used to do and we're making ourselves less meaningful, less relevant," he adds. "Why are we going to need ourselves so much in the future? We're just going to have the easy life." His comments are a direct reaction to the unimaginable speed with which technology has advanced since he and Steve Jobs founded Apple in 1976. "You don't realise it's happened until it's there and I think that awareness of machines is getting very, very close and we're getting close to where a machine will really understand you," Wozniak states. "My comment about the machines winning the war is partly a joke, but we've accidentally already put so much in place that we can't get rid of from our lives." "Once we have machines doing our high-level thinking, there's so little need for ourselves and you can't ever undo it - you can never turn them off." Normally this would be the point where I make a comment about Edward Furlong, the possible ubiquity of Guns N' Roses or Robert Patrick's affection for motorcycles, but instead of inviting a rash of commenters enraged by my flippancy, I'd like to congratulate Mr. Wozniak on his optimistic view of humanity's future. 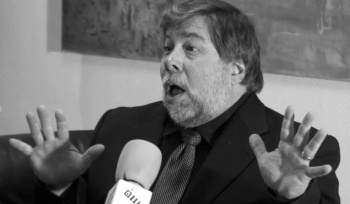 I think we can all agree that machines are taking an increasingly important role in every aspect of human life, and there's something comforting in hearing such a pleasant prognosis from a technological visionary like Mr. Wozniak. If, for no other reason, than Austrian cyborgs would make for terrible political leaders.